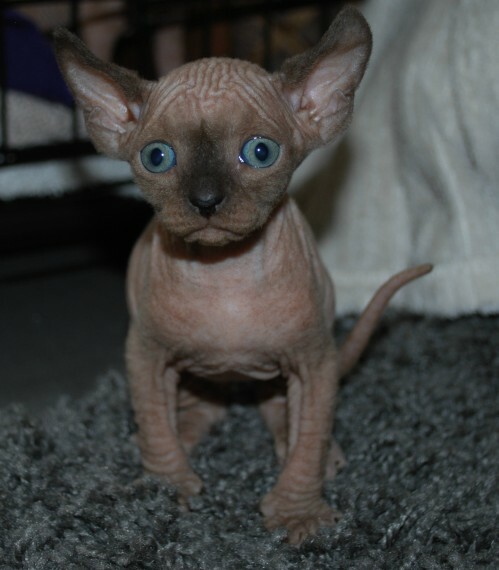 We have 6 elf kittens available for reservation 3 girls and 3 boys. If you would like a friend for life, ELF kitten will be the right choice!!!!!! Elves are extremely patient, intelligent, observant cats. They got it from their majestic ancestor Sphinx. Elves are very sensitive and tender towards all members of the family in which they live, and to other pets. A house for an elf is his fortress. On the other hand, elves love to be in the center of attention. Elves even wag their tail, just like dogs. Curious and frisky, the elf will conquer your household with irrepressible energy, fun and cheerfulness. We have kids and other animals, so kittens will be used to a busy household. All kittens will be microchipped, vaccinated twice (9 weeks and 12 weeks), also TICA registered, litter trained and wormed, will have 4 weeks free PetPlan insurance. Kittens will be ready to go to a new homes around 2nd of May We require 300 non refundable deposit. ELF CHOCOLATE POINT FEMALE - 1300 ELF CHOCOLATE TORTIE POINT FEMALE - 1300 ELF RED TABBY MALE - 1300 STRAIGHT-EARED ELF RED POINT MALE - 1000 PLEASE CONTACT ME TO ARRANGE A VIEWING! !